Feel the wind zip by as you descend Gunstock Mountain, with stunning views of the White Mountains, and the sensation of flying downhill. Ziplining at Gunstock satisfies the craving to soar down the mountain, providing that multi sensory adrenaline rush rivaling any ski descent. 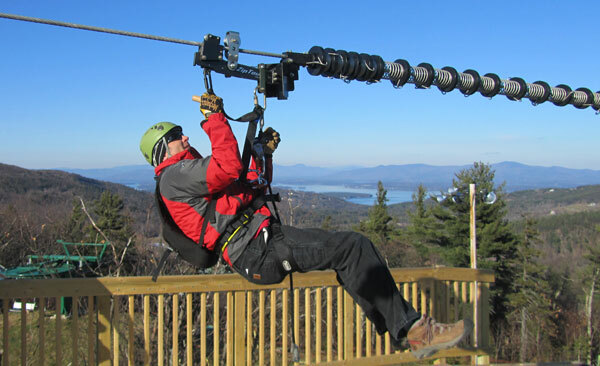 Gunstock’s ZipTour cost $1.5 million and quickly earned top accolades when it opened 2012 as the longest zip line tour on the Continental U.S. Gunstock’s zip covers a 1.5 mile total span descending the full 1,404’ vertical of the NH ski area. The ZipTour starts at Gunstock’s highly scenic summit, connecting to Pistol Peak, then plummeting to the base in just three segments. Compare that to Bretton Woods canopy tour which descends the mountain in 10 separate zips and Attitash’s Zip Tour is 5,000 in length from Bear Peak to the base. Gunstock’s zippy experience starts with signing your life away, suiting up in harness and backpack, and heading out to the bunny hill to ride the magic carpet and practice on two short segments where the Adventure Guide teaches you to use the trolley brake and accelerate system. Being able to control your own speed is one unique aspect of Gunstock’s ZipTour. You can take a slow scenic ride if you wish, stopping along the way down the tandem zip lines with your friend beside, or you can make it a race, tuck your feet up cannonball style and pull the trolley brake open wide to fly as fast as you can (that was my approach, more on that and reaching speeds of 65mph, in a minute). After orientation, you are clear for lift off, riding the Panorama Quad chairlift to Gunstock’s 2,300’ summit, in your helmet (provided or bring your own), and hiking boots or sneakers – instead of ski boots and skis this time. Standing at the top of the Summit Zip, you have unmatched views of Mount Washington and Lake Winnipesaukee. I should mention zip lining here is not for acrophobics, as the platforms, spiral stairs and the suspended cable are as much as 155’ high above terra firma. 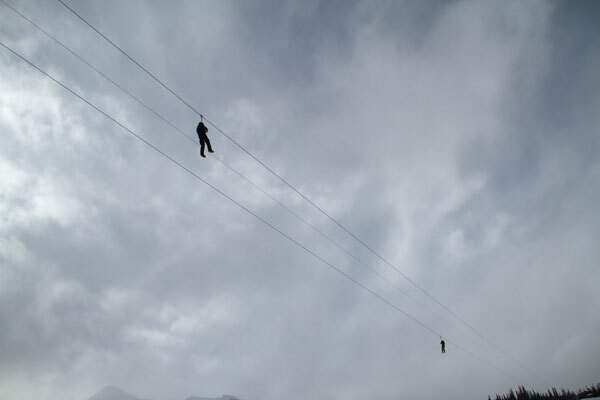 The first Summit Zip is short and sweet, 273’, transporting you in exciting descent to the big zipper. The Recoil Zip is a whopping 3,981’, the longest fastest segment as you fly over Recoil and Gunsmoke ski trail to Pistol Peak. The whir of the cable as you descend is like that of a pterodactyl in pursuit, with skiers below you on Gunstock’s slopes, what a rush for both parties. From atop Pistol, you descend your final 3,804’ section, over the Blundersmoke Terrain Park, flying over the jumps and features on the snow below at speeds of 30-60mph. You zip over the parking lot, the snowmaking pond and on to the last beautifully constructed pine platform. I immediately wanted to do it again, perhaps taking a more scenic method, but more likely trying to match or exceed my previous velocity (which I tracked at 64.9mph with iPhone ski app as very fast ski run). Gunstock’s zip experience takes about 2.5 hours, and costs $65, open year round weekends and holidays. Gunstock also offers Segway tours, a Tree Top obstacle course, and a 4,200′ Mountain Coaster up nearby Mt Rowe by Gunstock’s historic Nordic Ski Jumps. For details, age restrictions, and reservations go to www.gunstock.com. It is an unforgettable, unrivaled downhill experience. If you are looking for an alpine adrenaline rush, zip up to Gunstock, just 1.5 hours from Boston, and experience North America’s longest zipline. Warning: this activity could prove addictive. Gunstock is also an easy day trip from Boston.